Faux Discx is a record label based in Brighton, created and managed by (one third of Cold Pumas’) Dan Reeves. The label specialises in bringing guitar based art-rock back to the masses. It’s something of a phenomenon how their acts are sourced, and with each new release comes a new revelation. Earlier in the year Cold Puma’s redefined noise-rock with their seminal ‘Persistent Malaise’ album, and the labels recent release from Teardrop Factory, and up and coming EP from Shudder Pulps adds to their sterling catalogue. Teardrop Factory are a three-piece based in Brighton, and keeping in with the Faux Discx tradition of scuzz-pop and melodic guitar-based noise. 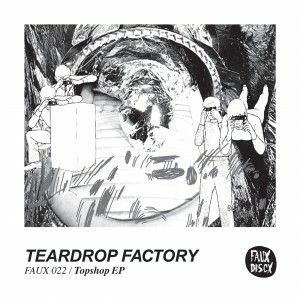 Their debut ‘Topshop EP’ is released as part of Faux Discx ‘Monotone’ 7″ series and completely encapsulates the many facets of their sound in the four tracks on offer. First up ‘Better Company’ kicks off the record and sounds like a slightly scuzzed out Beach Boys / Velvet Underground hybrid. This is a band that oozes cool, and is best listened to in the sun with some very dark shades. Production is distorted and lyrics, while coherent, are not first and foremost to the track. It has a very throwaway quality to it. Ending with a huge guitar solo, this is a very capable band who like to layer their sound and not always put their (very able) musicianship in your face. ‘Vanity Unfair’ is more typical shoe-gaze fair. Sounding like early Ride or Slowdive it builds as it plods along, growing louder with every chord change. It’s teaming with glorious feedback. As a pop record it works perfectly, and as the track presented here, it’s a scuzzed up noise guitar opus. Leading track on the flipside is ‘Stolen Skull’ which owes as much to Pixies, MBV, Sonic Youth as much as anything else here. It’s brimming with washed out cool, and comes armed with a bassline that will floor you. This has had some heavy rotation on my stereo. Title track ‘Topshop’ quietly chugs in with low vocals, but soon explodes into a huge guitar riff. This is the most striped down of the four tracks. Its very easy to hear how all of these tracks could have turned out by the tweak of the production. It’s essentially pop, with all of the catchy hooks, but what Teardrop Factory do best is veil its sound behind the scuzz, feedback and lo-fi production, which gives it added layers and complexity. This is easily the best EP I’ve heard so far this year, and I can’t wait to hear the album, which is currently in production. 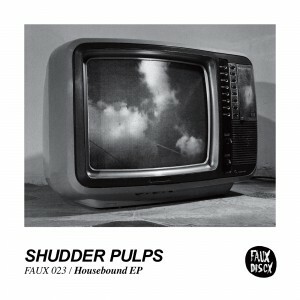 Next up is Shudder Pulps ‘Housebound EP’ which is out for release on the 12th August. Shudder Pulps follow in the footsteps of Teardrop Factory, but bring a harder, more punk edge to proceedings. From the top ‘The Tenth’ is a shouty little punk ditty, with brash bassline and guitar noodlings. Vocals are brimming with snarl and attitude. It’s a sound that rings of indie, post-punk, and will have any C86’ers jumping around their living rooms with joy. This is an EP not of it’s time, but one that harks back to when things were much more D.I.Y. ‘Kicker’ is the clear single of the three tracks on offer and crashes in with a blaze. The uncertainty in the vocals is incredibly endearing. This is a proper garage band. As their lyric suggests, they are indeed ‘scared of nothing’. The track rumbles on to a stop before ‘Kings’ kicks in with its Wedding Present aesthetic and dour vocals. There isn’t an ounce of technology or production trickery to hear, and they sound incredible for it. Teardrop Factory and Shudder Pulps have released two of the most inventive and authentic records I have heard in an age, and both have blown me away. I can’t wait to see them live and I can’t wait to hear their albums. Long live Faux Discx. 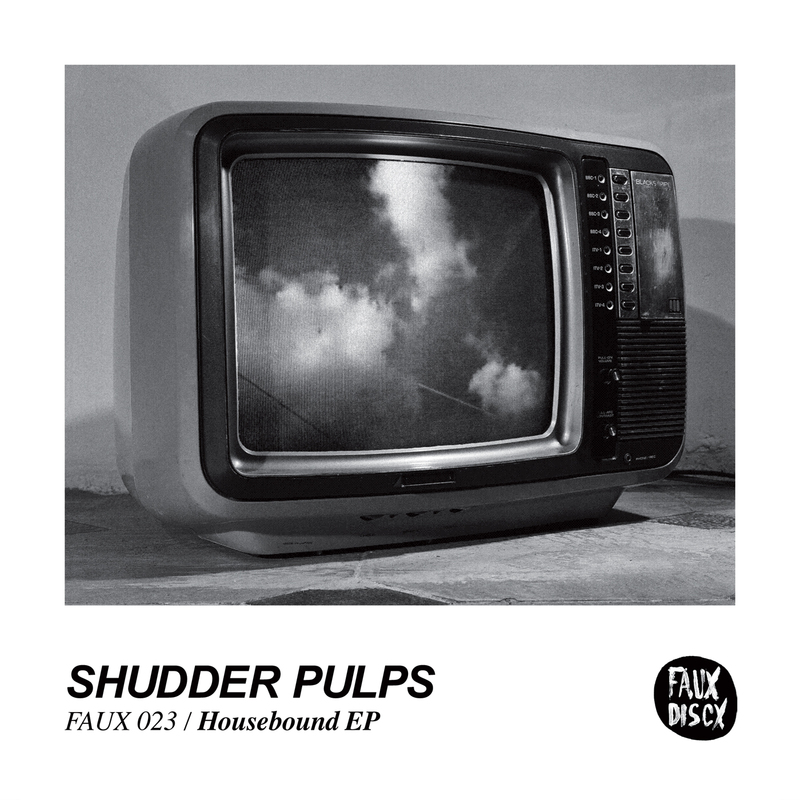 This entry was posted in Shudder Pulps, Teardrop Factory and tagged Faux Discx, Housebound EP, Shudder Pulps, Teardrop Factory, Topshop EP by admin. Bookmark the permalink.